Night had fallen and the portals of the Danish Church on the fringes of Regents Park were dramatically candlelit. Within, however, the illumination and drama were of a different order altogether. 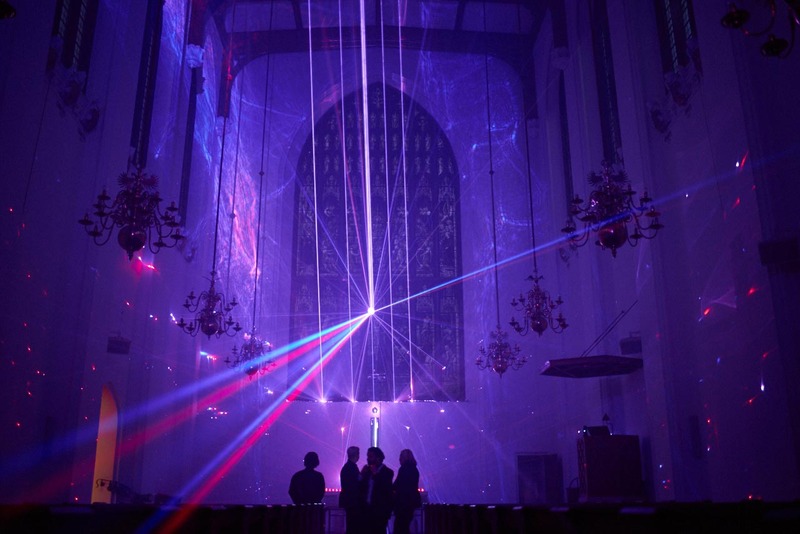 Walking down the nave through beams of red and blue light, half-images moving dream-like across the walls, was an uncanny experience. 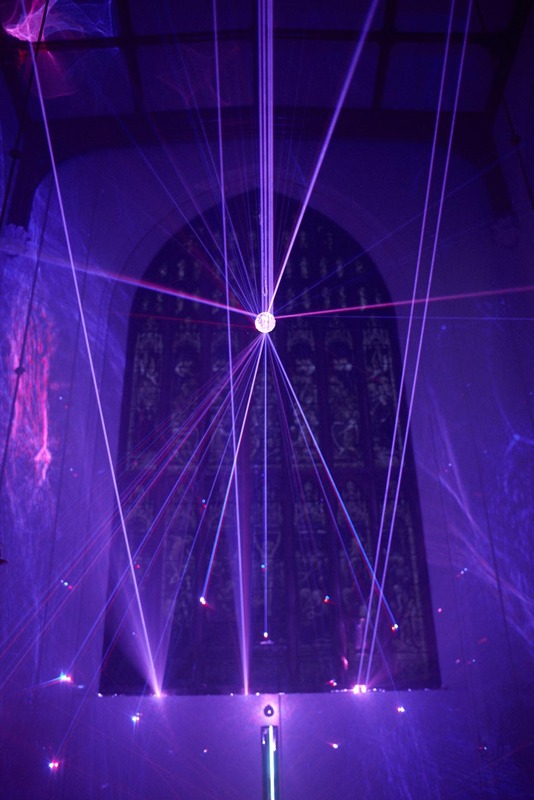 This was my introduction to Chris Levine’s new site specific, immersive light and sound installation, ‘Angel Presence’. 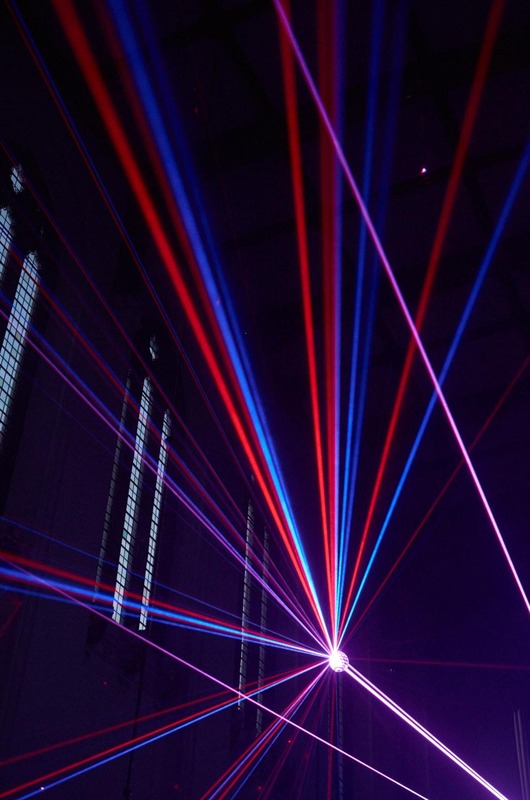 Levine uses cutting edge light-based technologies and has collaborated on projects with Swarovski since 2004. 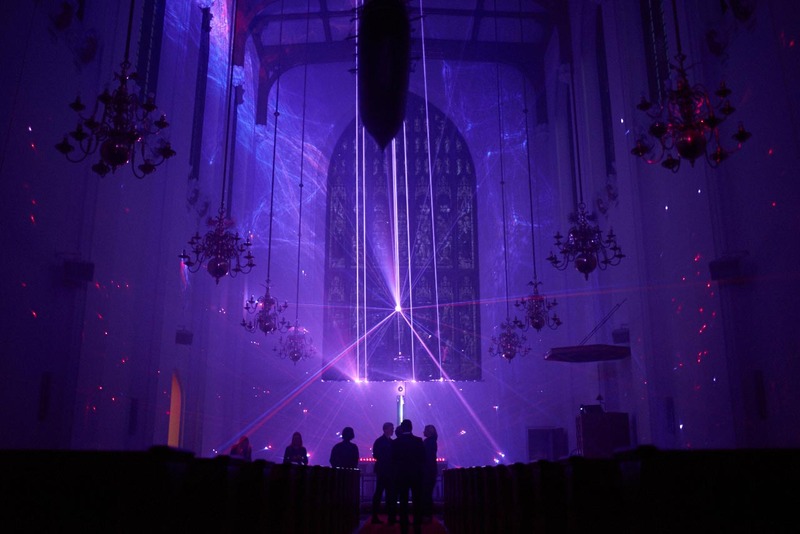 In ‘Angel Presence’ a laser beam hits a cluster of Swarovski crystals hanging like a divine disco ball at the heart of the space, diffracts, and throws out light across the church. Despite an extensive career working with light, Levine admits that there is always an element of the unknown in a new space, as each structure reacts to the light in unique ways. Perhaps best known for his holographic portrait of the Queen, ‘Lightness of Being’, this show reminds one of the true scope of using light as a medium; where holography produces something solid and finite – even if the image itself seems to move, presenting a deceptive depth – ‘Angel Presence’ presents light as an intangible and enigmatic visual experience, conversely infinite. There is also the sound element. Putting on headphones, the rhythmic undulations merge sense and sight, so that the mind is quietened as rational, conscious analysis is halted. Amidst our frenetic daily realities, Levine has aimed to create a ‘meditative state of heightened awareness … recalibrating and harmonising us with reality’. This concept has echoes of Eastern spiritualism and yogic traditions such as ‘Om’, a sacred sound and symbol often used to aid meditation. A sense of ancient mysticism is produced by the most contemporary technology. The choice of a Protestant church as a site for this installation is therefore interesting. Various forms of spirituality are successfully unified here – yet Levine deliberately chooses not to use the word ‘religious’; its violent connotations in a world torn apart by religious conflict are the antithesis of what this piece is about. At the same time, however, the installation very much speaks to the Christian past. The beams of light passing through the crystal echo what medieval craftsmen aimed for with stained glass windows which filtered natural rays of light in order to induce a sense of awe and piety – a mystical sense of benediction – among the congregation. 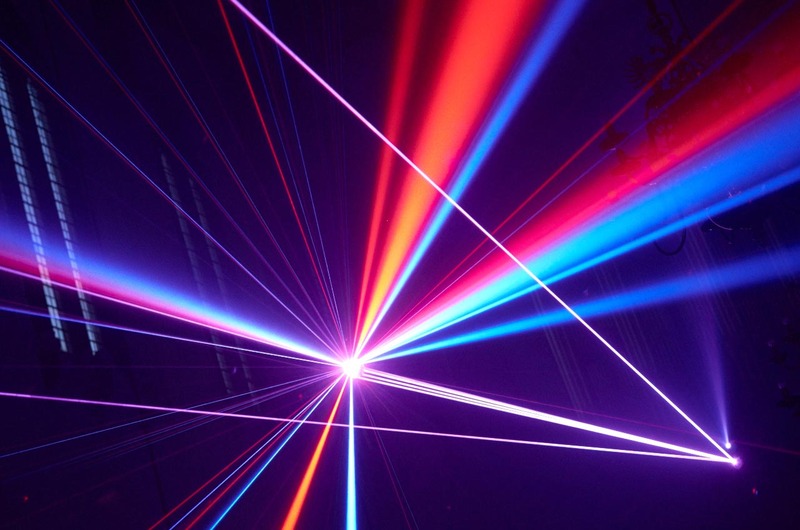 Levine also spoke of the idea of ‘purity’ inherent in single wavelength light – a word that might also refer both to the quality of a substance such as crystal and to a moral state that seems defined in the simple whitewashed walls of the church over which this pure light travels. The result is hypnotic and transcendental; in the midst of Frieze week frenzy, it offers the ultimate restorative.